4 - 16 gauge 430 stainless steel. 2 - 14 gauge 304 stainless steel. 1 7/8" turn down on 4 sides with a 90° return. V type marine edge to inhibit spillage. Two heavy gauge steel box channels on 24"
Three heavy gauge steel box channels on 30"
18 gauge 430 stainless steel. 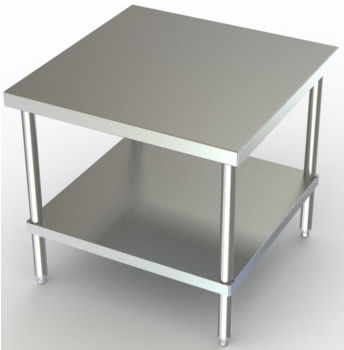 series stainless steel tubing, complete with 1"
Table hemmed to eliminate cuts from rough edges. Top is polished to a #4 mill finish. Gussets fully welded to eliminate damage to table top. NOTE: For crossbracing in lieu of undershelving, call us. "V" type edge on all mixer stands. and Work Tables from your source for material handling equipment.